Varuthini Ekadashi is celebrated on Friday April 25th in 2014. Varuthini Ekadashi falls on the 11th lunar day (Ekadashi). According to Hindu Calender which occurs in Chaitra masam (March/April). 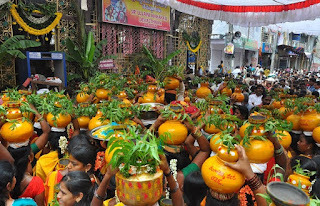 Varuthini Ekadashi is also called as Baruthani Ekadashi and Varudhini Ekadashi. Varuthini Ekadashi is observed during Krishna Paksha of Vaishakha month according to North Indian calendar and Krishna Paksha of Chaitra month according to South Indian calendar. But it is observed on the same day. This Ekadashi is dedicated to Vamana Avatar, fifth incarnation of Lord Vishnu. The Significance of Varuthini Ekadashi: Lord Krishna narrated about this Ekadashi vrat to king Yudhishtira, This is According to Bhavishya purana. Varuthini Ekadashi fast is considered as sacred and one who observes it, protected from all harm and evil and will obtain happiness on earth and even after death, good fortune and attains moksha. During the fasting Chanting of Lord Vishnu Mantra attains good fortune.